The Bachar/Yerian is to 5.11 climbing what the Dike Route is to 5.9 climbing—classic and tremendously runout. Up until the crux, the route follows an amazing white dike that diagonals up the granite wall. At the crux, the climbing moves up small knobs, edges and smears. 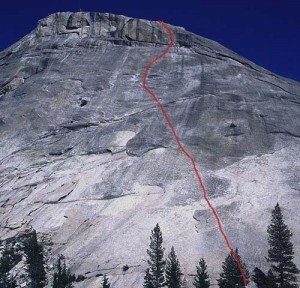 To think that this climb was first done without sticky rubber climbing shoes makes one wonder what mad climbs the pioneering Tuolumne climbers would have done had they been equipped with today’s modern gadgetry. Which SuperTopo guidebooks include a topo for Dike Route?